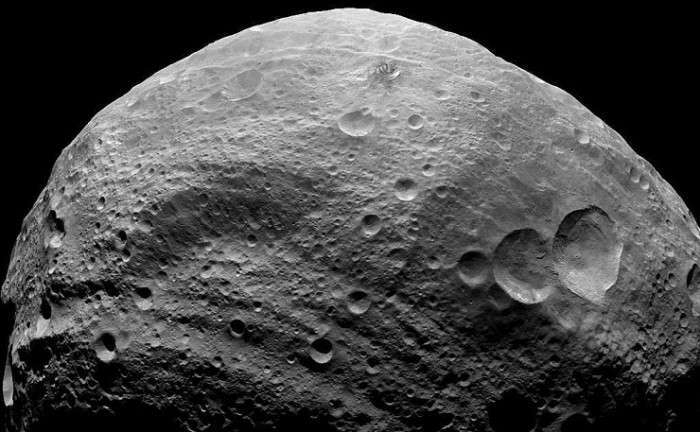 In a shocking announcement, Russian scientists say they want to test improved ballistic missiles on the asteroid Apophis, which is expected to come dangerously close to Earth in 2036. If this doesn't send chills down your spine, you haven't read enough science fiction. In a February 11th article in the Russian state-owned news agency TASS, Sabit Saitgarayev, the lead researcher at the Makeyev Rocket Design Bureau, says Russian scientists are developing a program to upgrade Inter-Continental Ballistic Missiles (ICBMs) to destroy near-Earth meteors from 20-50 metres in size. Apophis' approach in 2036 would be a test for this program. ICBM's are the kind of long range nukes that the USSR and the USA had pointed at each other for decades during the Cold War. They still have some pointed at each other, and they can be launched quickly. This program would take that technology and improve it for anti-asteroid use. Typical rockets of the type that take payloads into space are not good candidates for intercepting asteroids. They require too much lead time to meet the threat of an incoming asteroid that might be detected only days before impact. They can take several days to fuel. But ICBM's are different. They can stand at the ready for long periods of time, and be launched at a moment's notice. But to be suitable for use as asteroid killers, they have to be upgraded. Design work on the asteroid-killing ICBM's has already begun, admitted Saitgarayev, but he did not say whether the money has been committed or whether the authorization has been given to go ahead with the project. But like a lot of things that are said and done by Russia, it's difficult to know exactly where the truth lies. There's no question that being prepared to prevent an asteroid strike on Earth is of the utmost importance. No matter where on Earth one was to strike, the effects could be global. But one thing's certain: the development and testing of missiles designed to be used in space is unsettling. It's also unsettling in light of the January 16th TASS article stating that "The international scientific community has asked Russian scientists to develop an asteroid deflection system on the basis of nuclear explosions in space." Taken together, the two announcements point towards a program of weaponizing space, something the international community has agreed should be avoided. In fact, there is a ban on nuclear explosions in space. We don't want to be alarmist. There are only a handful of countries in the world that have the capacity to develop some protective system against asteroids, and Russia is definitely one of them. And if Earth were threatened by an asteroid, the weaponization of space would be the least of our concerns. The fact that Russia wants to develop a missile system with nuclear warheads, and employ it in space, is not entirely unreasonable. But it should make us stop and think. What will happen if something goes wrong? It's easy to imagine a scenario where an atomic explosion went off in low-Earth orbit. What would the consequences be? And what are the consequences to having one country develop this capability, rather than an international group? How can this whole endeavour be managed responsibly? There will be so many advancements in the next 20 years that we would not recognize civilization. Probably by then we could just burn it out of the sky with a laser or a least steer it. If someone does this this should be an international effort and the bases for such missiles should be on international terrain (sea based, antarctica or similar). One nation going ahead with a missile plan is not a good idea. So Russia is just now playing Asteroids while the rest of the world is playing Black Ops. But it does highlight the many beneficial uses for fissiles in space. The solar system will be conquered using nukes for power, demolition, construction... and intimidation. ... not to mention illegal. "The international scientific community has asked Russian scientists to develop an asteroid deflection system on the basis of nuclear explosions in space." First I've heard of this. Who might this international scientific community be? The Russians (some Russians) seem to think alot of themselves. Wait, they're not proposing to launch a nuke! Only a rocket that could otherwise be used to carry one. *ANY* large rocket could carry a nuclear weapon; if it doesn't it's not a "nuclear missile" and it's not illegal. Nor would there be any risk of releasing fissile material because there wouldn't be any! I think this is a great idea and NASA should be doing it too; the "launch ready" feature would be very helpful, and not just for delivering nukes. Think of launching emergency supplies, getting instruments into space on very short notice (to observe a supernova, for example), or non-nuclear methods of deflecting a comet on short notice. IMO, this is a great way to re-purpose nuclear weapons - put the launch vehicles to good use and burn the plutonium for electricity. And in the event of a real emergency where a comet had to be deflected on short notice, violating the ban on nuclear weapons in space would be the least of our worries. "But like a lot of things that are said and done by Russia, it's difficult to know exactly where the truth lies." What does this statement add to the story? The reminder that Russia is known to say one thing and do another thing. Like with the little green men in Crimea who weren't supposed to even exist according to Russia until Putin admitted that they had troops on the ground all along. The real reason for the asteroid-bashing missile might be internal propaganda, external propaganda, or developing new ICBM to point at other countries rather than asteroids, or all of that. That said, nuclear weapons don't work very well in space. Their effect is due to the sudden heat and radiation creating a very large shockwave in the atmosphere. In space, a nuclear bomb basically just makes a bright flash of light, and detonating one near to an asteroid wouldn't actually do much. Contrary to common belief, ICBMs and the nuclear warheads don't hit the ground. They're detonated high above the target to maximize the exposure to radiation and heat from the fireball. An ICBM shot at an asteroid would similiarily detonate off the surface - from tens of kilometers to hundreds, depending on how well they manage to aim. To have an effect on an asteroid, they would pretty much have to land a nuclear warhead on it. Otherwise the radiation effect diminishes in the inverse square of distance and while the sudden flash would create a puff of dust and vapor from the surface, it wouldn't actually break or shift the asteroid much at all. Lobbing ICBMs at asteroids is a rather pointless proposition, but it serves as perfect target practice if you want to hit New York or London, because it gets around the nuclear testing ban and international diplomacy problems of practicing on targets on earth. I agree with rderkis, I don't see any point in planning to do something to be tested in 20 years time, tech will be completely different then. My immediate thought was that it's actually going to hit us, and this 'test' is actually a live attempt to try and deflect it. Other than for that reason, this is completely pointless. Correct. Even more so, it's a quick flash. Blink and you will likely miss it. It may not have to (see below). And in an emergency, one could use a bunker buster below the surface for extra push. Some ICBMs contain ground penetrating warheads. depending on how well they manage to aim. Maybe that is the point of the test? it wouldn't actually shift the asteroid much at all. Surface evaporation = reaction mass. With enough lead time, a few mm per second might be enough because gravitational effects snowball. The "ready to launch" capability of ICBM launchers gives more lead time. Lobbing ICBMs at asteroids... gets around the nuclear testing ban. The ban covers nuclear devices. Launching a rocket with no warhead "gets around the ban" in the same way that throwing a baseball gets around the ban. It simply doesn't apply. BTW, it's no longer an ICBM (check acronym). Contrary to popular eikka belief he should know more about the subject or at least do a little research before commenting. "The B61 Mod 11, which first entered military service after the Cold war had ended, in January 1997, was specifically developed to allow for bunker penetration, and is speculated to have the ability to destroy hardened targets a few hundred feet beneath the earth." -These weapons/demolitions can be, and are, configured to suit the mission. An asteroid penetrator may produce additional thrust from crater ejecta. "Hypervelocity Asteroid Intercept Vehicle (HAIV) mission architecture which aims to optimally fragment and disperse hazardous near-Earth objects (NEOs) using a hypervelocity kinetic impactor combined with a subsurface nuclear explosion has been developed by the Asteroid Deflection Research Center (ADRC), Iowa State University, through a 2011 NASA Institute for Advanced Concepts (NIAC) Phase I study." Research - It's what the internet is for, no? You are all guessing. And none of you are considering the Neutron flux or the thermal radiation. And it is a double-flash. ICBMs and the nuclear warheads don't hit the ground. They're detonated high above the target to maximize the exposure to radiation and heat from the fireball. "City busters" are set to detonate at altitude. ICBMs aimed at hard targets (like missile silos and bunkers) are often set to detonate on or below the ground (incidentally, those ground bursts create the worst fallout). ...it serves as perfect target practice if you want to hit New York or London. You don't need to be accurate to hit New York or London. You DO need to be accurate to launch a first strike (i.e., to hit missile silos). But if you think either Russia or the USA can't already put one with a few meters of where they want it, I have a bridge to sell you. Practicing on asteroids wouldn't help. Residual inaccuracy is due to variations in the the upper atmosphere, small scale variations in gravity etc. - effects local to Earth. You'd test those with satellites. Being an optimist I'm always looking for the silver lining. So, I would say they aiming these missiles at asteroids, instead of the earth, is a good thing... no? Agreed, it's irrelevant. But the story was written to be sensationalist. I wouldn't trust Putin as far as I could throw him, but Putin =/= Russia. IMO, we ought to support space exploration (and potential defenses against asteroid impacts!) by anyone and everyone. We need to get off the planet. As an American I'd prefer the US take the lead. But far better China, India, Europe and Russia than nobody. And whatever their motivations, Russia and the USSR have made a lot of valuable contributions to space exploration! So how about instead of complaining, we either cooperate or race them to the asteroids? That's what got us to the Moon and it would benefit all of humanity. -His psychopathy makes george think that the people at the Asteroid Deflection Research Center (ADRC), Iowa State University, and the NASA Institute for Advanced Concepts (NIAC), are all guessing. Psychopaths like to drop names and technical terms to imply they know things that they do not. Hey george do you think that the people at the Asteroid Deflection Research Center (ADRC), Iowa State University, and the NASA Institute for Advanced Concepts (NIAC) may have considered your 'neutron flux' and thermal effects and 'double-flash' in their designs? BTW please explain what neutron Flux has to do with blowing asteroids apart. Can you do that georgie? Surface evaporation = reaction mass. Flashing nuclear weapons off to the side of a billion-ton asteroid has the same problem as the proposed rocket that was supposed to fly on nuclear explosions: you need many many many explosions. A whole convoy of missiles headed that way to make a clear exit. Otherwise you just risk destabilizing the orbit and getting hit later. A nuclear bunker buster shot into an asteroid would simply turn it into a shotgun blast headed straight for earth with millions of smaller and larger boulders spraying everywhere. Breaking up the asteroid is the last thing you want to do. An ICBM is an ICBM when your purpose is to use it to target the earth, even if you do target practice on asteroids, just like an anti-tank cannon is still an anti-tank cannon even though you target practice on wooden cutouts. But if you think either Russia or the USA can't already put one with a few meters of where they want it, I have a bridge to sell you. The problem is that nobody knows - not even the Russians know if their targeting systems are as reliable as they think because none of it has seen any real action and the old missiles from the cold war are rotting to pieces. Even the US would be blowing dust off of floppy disks. Nobody on earth so far has shot a modern ICBM at another country, and they've tested the new missiles only once or twice amidst international protests. The Russian new "NATO busting" missiles for example have so far failed half of the launch attempts and hit a practice target once. They have no idea how well or consistently they would work in a real situation. ""Hypervelocity Asteroid Intercept Vehicle (HAIV) mission architecture which aims to optimally fragment and disperse hazardous near-Earth objects (NEOs) using a hypervelocity kinetic impactor combined with a subsurface nuclear explosion has been developed by the Asteroid Deflection Research Center (ADRC), Iowa State University, through a 2011 NASA Institute for Advanced Concepts (NIAC) Phase I..."
-plus those of others which I've referenced... or I could accept the opinion of someone here who doesn't seem to be aware of them nor of much about the subject in general, nor of engineering at all. Help me out here eikka. As to accuracy it is the warhead and not the missile which determines accuracy. "yes, the US Air Force has performed MIRV re-entry testing. Even though the actual accuracy is classified when public estimates of 200m CEP are cited for warhead accuracy for the Minuteman III, it is probably a good bet the warheads are at least that accurate."